Gluten Free - What can I eat? Daily menu plans. Bacon - Oscar Meyer Center Cut is one type you could have. 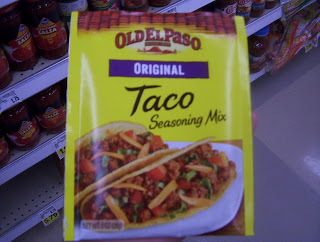 Old El Paso Dinner Kit, Stand and Stuff Tacos with all the fixings. Remember to check the cheese label to make sure there is no gluten added, otherwise, you are good to go with tomatoes, lettuce, cheese and sour cream. Brownies - From Wheat Free Recipes and Menus by Carol Fenster MD. Preheat oven to 350 degrees F. Grease 8-inch square nonstick pan. Stir together gluten free flour blend, cocoa, baking powder, salt, and xanthan gum. Set aside. In large mixing bowl, beat butter, sugars, egg, and vanilla with electric mixer on medium speed until well combined. With mixer on low speed, add dry ingredients and hot water or coffee. Mix until just blended. Mixture will be somewhat thick. Stir in walnuts, if using. Spread batter in prepared pan with wet spatula. Bake for 20 minutes. Note: I use different flour blends, depending on what I have. Sometimes I use the Hodgson Mill baking mix and sometimes gluten free Bisquick. I've even used a gluten free pancake mix with good results. These brownies are wonderful. I do recommend using the coffee if you have it, because it results in a much richer flavor. You will need to treat this gluten free lifestyle just like you would if it were a peanut allergy. You will want to stay away from any food that contains gluten, but also any foods that may have come in contact with gluten along the way, during processing or cooking. You'll want to avoid kissing anyone who just ate a cracker. You'll need to get a new toaster if you are going to toast your gluten free bread. You'll need to avoid oats and grits, both of which are usually contaminated in the field, unless they are specifically marked as gluten free. You'll need to have your own peanut butter jar, your own jelly jar and your own butter. If you have to make your kids a sandwich, wash your hands or better yet, wear gloves. 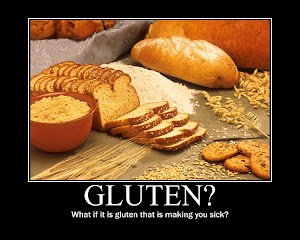 If you aren't sure if a food contains gluten, avoid it. You will also need to watch out for gluten in beauty products such as lipstick. Again, read labels! I am not a medical professional. I am not going to give advice about whatever condition you have that makes you need to go gluten free. I am not going to talk about the whys, just the hows. These are just some examples of what you can eat. It is not necessarily a balanced diet and might not contain the most healthful choices. It's mainly for you to get ideas in a less intimidating way than a big, old list. Remember, always, always, always read the labels because gluten content may change. What did we have for dinner today? Odd benefits of not eating gluten. Interesting Idea - Breadless sandwiches. Gluten free mom getting the food on the table.